You may have heard: Washington DC is full of snow wimps. Even the threat of snow prompts schools to close and governors to order a state of emergency. Here in Alexandria, Winter Storm Pax has dumped eight inches of snow, which is now being crusted over by sleet and rain. Ugh, some heavy-duty shoveling awaits. But today’s snow is just a blip compared to some of the worst snowstorms we’ve weathered here. A recap, with thanks to NOAA — and apologies to my friends and family who live in REAL snowbelts. The difference is that you can handle it. Here, not so much. January 7-13, 1996. NOAA calls it the Great Furlough Storm because it came on the heels of the infamous federal government shutdown. Just as federal workers were about to return to work, Mother Nature intervened. By the time three separate storms blew through, Washington was buried under up to 3 feet of snow. At our house, Will’s friend Nick came for a sleepover and wound up stranded at our house for several days. Fond memories of seeing those childhood buddies romping in the snow. February 15-17, 2003. Call this one the President’s Day storm. Much like the current storm, this one started down south and moved up the eastern seaboard, dumping 16 inches to 26 inches of snow. Will and Sam built snow caves in the front yard. February 13-14, 2007. The Valentine’s Day sleet storm. Snow turned to ice which knocked out power. Sam was visiting a friend at Boston College by way of Jet Blue. The airline canceled hundreds of flights and stranded Sam, who wound up taking the train home on a trip that took 12 hours. Jet Blue took years to recover from an operational and PR disaster. December 18-19, 2009. The Christmas Eve storm dumped 16 to 18 inches of snow on all three area airports at the start of the holiday travel season, snarling air traffic for the rest of the holiday. February 5-10, 2010. This storm spawned the nickname Snowmageddon. It was really two back-to-back storms. 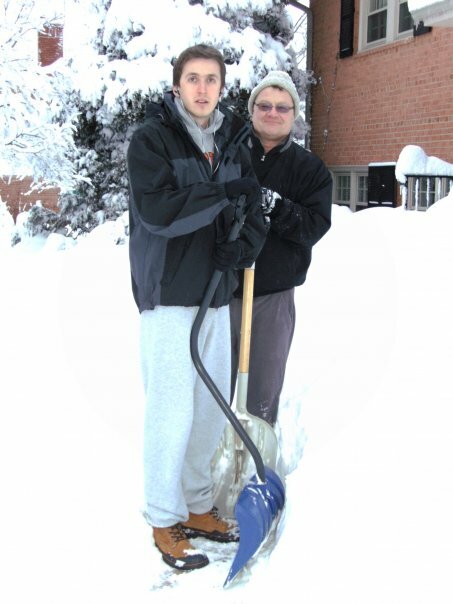 The first dumped 18 to 32 inches of snow, followed a few days later by another foot. The one-two punch broke the previous record set by the Knickerbocker storm of 1922, infamous for a collapsed theater that killed 100. At our house, we were relieved that Sam was still home for an elongated holiday break before he went abroad for a semester. Young strong shoulders. What are your most vivid snow memories?